It was in the early hours of January 1, 1904, during an all-night prayer meeting, that the ministry of European Christian Mission was born. Interestingly, the location of that meeting was not North America and the language spoken by those who gathered was not English. 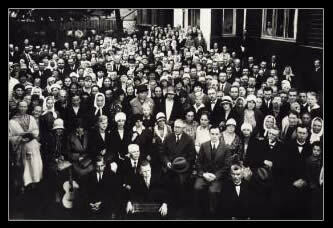 In fact, the Mission was born in Estonia and the mother tongue of the founder, and of those who gathered, was Estonian. Little did G. P. Raud, and those who were present, realize the enduring impact and consequences of their prayers! Our founder records, "The prayers of God's people thrust me forth into the path which He had chosen for me. My father, my brother Wil, and I were engaged in evangelistic meetings in various villages over the Christmas season. On New Year's Eve we took part in a special meeting and through the outpouring of the Lord's grace about forty persons came to Christ and backsliders were delivered from their sins. When most of the audience had left for home, a good company of men, including ourselves, remained for prayer all that night. In that all-night prayer meeting the Lord laid it upon the hearts of the men to pray for me that I might be in His service without delay.When we ceased praying, quietness stole over the company; heaven seemed very near to us. From that time new grace was upon me for His service”. "God has not abandoned Europe to the adversary to be his plaything... If by our neglect we leave Europe to the enemy of souls, its darkness will increase to produce worse darkness."